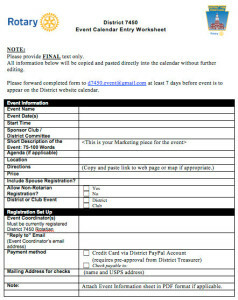 Do you have an event that you want to add to the Calendar for your Club or for the District? Your District Technology Committee is happy to help. All we need are the details and the wording that you are using to promote your event. To help, we have created the Event Calendar Entry Worksheet. This identifies all of the needed information to add your event to the DACdb Calendar. Once the document is completed, email it to Brian.Casey at brian.casey at SwarthmoreRotary.org. To get the required lead time to set up the event and get the benefits of having the event on DACdb, please submit the completed worksheet no less that 2 weeks before the event. We are here to help make your event promotion effective and the more information that you provide for the calendar, the better. If you have any questions, please contact Brian Casey at 484-483-8423 or brian.casey at SwarthmoreRotary.org. Error: Error validating access token: Session has expired on Friday, 01-Mar-19 13:00:41 PST. The current time is Wednesday, 24-Apr-19 21:28:49 PDT.